In the world of technical analysis there are a lot of traders who talk about price action patterns but few actually discuss how accurate they are in the live market. There are a number of useful patterns we watch for here at Samurai Trading Academy and although we don't trade these patterns directly, they are very useful to understand the current structure of the market and quickly assess our trading opportunities. 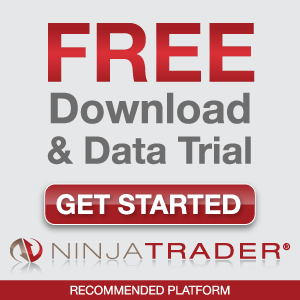 The statistics on the price action patterns below were accumulated through testing of 10 years of data and over 200,000 patterns. In all these cases the price action patterns were only included once they were considered to be complete, which usually means a full break of a support/resistance area or trendline. The requirements for a completed pattern are discussed below for each individual case. The flag is a continuation pattern that can occur after a strong trending move. It consists of a strong bullish trending move followed by a rapid series of lower highs and lower lows for a bull flag, or a strong bearish trending move followed by a rapid series of higher lows and higher highs for a bear flag. These patterns are small hesitations in strong trends, so they are usually only composed of a small number of price bars (about 20). Longer and wider patterns are defined as channels (see below). The flag pattern appears as a small rectangle that is usually tilted against the prevailing trend in price. The best flag patterns have two features: 1) a very strong run in price (near vertical) prior to the setting up of the flag and 2) a tight flag that occurs right on the upper (or lower) edge of that run. The higher and tighter (narrower) the pattern, the higher percentage that the pattern will break favourably in the prevailing trend direction. This pattern is considered successful when it breaks the upper trendline in a bull flag (or the lower trendline in a bear flag) and then proceeds to cover the same distance as the prior trending move starting from the outer edge of the pattern. Note that most pattern projections are measured from the breakout point, but flags, pennants, and channel patterns are all measured from the outer edge of the pattern instead as shown by the red arrows in the chart examples. The triangle pattern usually occurs in trends and acts as a continuation pattern. It's defined by a bullish trending move followed by two or more equal highs and a series of higher lows for an ascending triangle pattern, and a bearish trending move followed by two or more equal lows with a series of lower highs for a descending triangle pattern. The pattern is complete when price breaks above the horizontal resistance area in an ascending triangle, or below the horizontal support area in a descending triangle. The pattern is considered successful if price extends beyond the breakout point for at least the same distance as the pattern width (see red arrows). The channel price pattern is a fairly common sight in trending moves that have good volume and acts as a delayed continuation pattern. Note that the channel pattern is similar to the flag in that they both have periods of consolidation between parallel trendlines, but the channel pattern is generally wider and consists of many more bars which increases its strength and success rate. 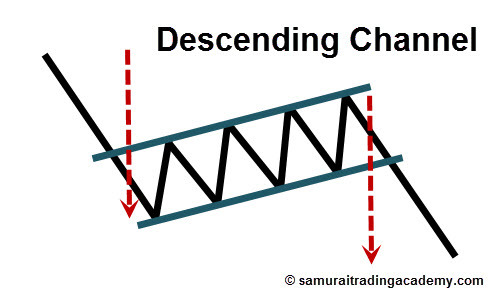 The ascending channel pattern is defined by a bullish trending move followed by a series of lower highs and lower lows, that form parallel trendlines containing price. The descending channel pattern is defined by a bearish trending move followed by a series of higher lows and higher highs, that form parallel trendlines that contain price. This pattern is complete when price breaks through the upper trendline in an ascending channel or below the lower trendline in a descending channel pattern. The pattern is considered successful when price has achieved a movement from the outer edge of the pattern equal to the distance of the initial trending move that started the channel pattern. The double top/bottom is one of the most common reversal price patterns. The double top is defined by two nearly equal highs with some space between the touches, while a double bottom is created from two nearly equal lows. Generally, the wider the gap between touches the more powerful the pattern becomes. The pattern is complete when price breaks below the swing low point created after the first high in a double top, or when price breaks above the swing high point created by the first low in a double bottom. The pattern is considered a success when price covers the same distance following the breakout as the distance from the double high to the recent swing low point in a double top, or the distance from the double low to the recent swing high in a double bottom (see red arrows). This is actually the first of our patterns with a statistically significant difference between the bullish (double bottom) and bearish (double top) version. As we can see, the double bottom is a slightly more effective breakout pattern than the double top, reaching its target 78.55% of the time compared to 75.01%. The triple top/bottom is another variation of reversal price patterns. The triple top is defined by three nearly equal highs with some space between the touches, while a triple bottom is created from three nearly equal lows. Generally, the wider the gap between touches the more powerful the pattern becomes. The pattern is complete when price breaks below the swing low points created between the highs in a triple top, or when price breaks above the swing high points created between the lows in a triple bottom. The pattern is considered a success when price covers the same distance after the breakout as the distance from the triple high to the furthest swing low point in a triple top, or the distance from the triple low to furthest swing high in a triple bottom (see red arrows). The rectangle price pattern is a continuation pattern that follows a trending move. It is very similar to the channel pattern, except that the pattern does not have a slope against the preceding trend which gives it a higher chance of successful continuation. The rectangle pattern is defined by a strong trending move followed by two or more nearly equal tops and bottoms that create two parallel horizontal trendlines (support and resistance). 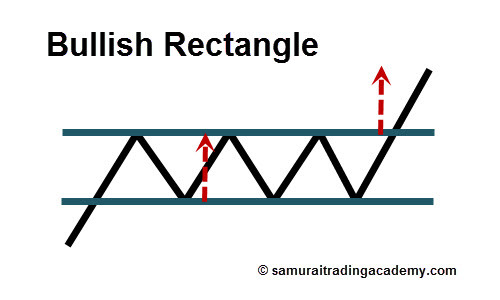 The only difference between the bullish and bearish variations is that the bullish rectangle pattern starts after a bullish trending move, and the bearish rectangle pattern starts after a bearish trending move. It's worth noting that these rectangle price patterns are essentially failed double and triple tops/bottoms. Because the swing points following the double and triple highs or lows don't break to confirm the patterns, those reversals are not confirmed. This is why it can be very dangerous to try to anticipate double and triple tops/bottoms, because often they don't fully complete and price will resume the prior trend. The rectangle pattern is complete when price breaks the resistance line in a bullish rectangle, or when price breaks the support line in a bearish rectangle. The pattern is considered successful when price extends beyond the breakout point by the same distance as the width of the rectangle pattern. The head and shoulders patterns are statistically the most accurate of the price action patterns, reaching their projected target almost 85% of the time. 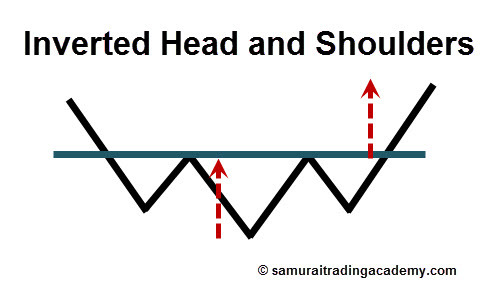 The regular head and shoulders pattern is defined by two swing highs (the shoulders) with a higher high (the head) between them. The inverted head and shoulders pattern has two swing lows with a lower low between them. The two outer swing highs/lows don't have to be at the same price, but the closer they are to the same area the stronger the pattern generally becomes. The pattern is complete when price breaks through the "neckline" created by the two swing low points in a head and shoulders, and the two swing high points in an inverted head and shoulders. In the chart examples above this line is horizontal, but it can also be sloped as the swing points do not have to be exactly the same to have a completed pattern. These patterns are considered complete when price breaks out from the neckline and moves a distance equal to the distance from the neckline to the head of the pattern. Although we've already covered the seven best price action patterns, I thought it would be useful to include one more pattern because of it's comparatively poor performance despite being commonly used. The pennant pattern is one that you often see right next to the bull and bear flag pattern in the textbooks, but rarely does anyone talk about its low success rate. While the flag itself isn't an exceptional pattern at just under a 70% success rate, the pennants come in well below that. Like the flag, the pennant often occurs in high momentum markets after a strong trending move, but the tight price formation that occurs can lead to breakouts against the preceding trend almost as often as we get continuation. The slight difference in the price pattern formation between flags and pennants is an important distinction that can make a big difference in your trading results so it's well worth being aware of while watching the market develop during your trading day. This is a really good read for me, thank you! Very useful! You’re welcome, DT. Good to hear you’ve found it helpful. This information is awesome. Thanks for taking the time out to put it together for traders like myself. You’re welcome, Matt. Glad you found it useful and hopefully I can keep some good day trading educational material coming for the interested traders out there. This is fantastic! Seriously, thanks so much for putting this together. Probably the best analysis of these patterns I’ve seen and very useful to know how they rank! Thanks for the kind comment! It’s very appreciated because it took me a while to put this post together. Well worth it though if traders are finding value from it. Cheers!